Two Aquarius together is just double fun and double excitement. They may have different styles but initially they share common interests and similar ideology. They both are always first a friend to each other and then they look at the inner side of their relationship. Aquarius always dream about something very different and strive for the impossible. They look all around them except for down, therefore not realizing the possible ground they may be passing by without knowing it. Aquarius never lies and they hold their heads high with any statement or decision made. They often waver on the edge of genius and insanity. They have the ability to achieve anything and everything and their ways towards life are quite different from that of the general people. Often extremely outgoing, they love their independence and push past the limits to reach their goals, whether they are practical or not. Aquarius is just a synonym to happiness, invention and enthusiasm. Where ever they are they always have a lot of friends and a lot of fun. Their company is an ever exciting one with so much new to discover. 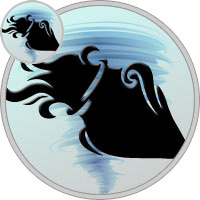 Aquarius always values a partnership in which there is mental and social interaction. A relationship that involves two Aquarius needs tolerance and cooperation. They do not have to worry about too much intensity as they seldom go beneath the surface of one another. Although Aquarius people often complain about pretty much anything and demand change, except for the way they perceive things or act toward anything, they do have a wide range of friends. They are both too frivolous in life and are very happy with quite the artificial type of connection. They, however, are mentally connected in a way that conversation between them is never dull. Intelligence is another virtue that runs strong with Aquarius. There is not a lot of passion in this relationship, but the comfort level is high as are the positive responsiveness and courtesy. The lack of jealousy and possessiveness is a plus also in any relationship that two Aquarius people share. Chemistry runs high in this connection as they both possess a great ability of practicality and logic rather than basing decisions on emotion. They have the same goals and understand each other very well. Their independence keeps the relationship from becoming too controlling. On the down side, they share many of the same negative qualities as well, and this can cause controversy in their relationship. They both have to compromise to make this work. Aquarius tends to work hard toward whatever their goals may be, including keeping the bond between them strong. Respect and responsibility forms and this helps them work through the tough spots. Aquarius knows enough to give the other one the freedom they need to get back on the path they were driving down. With some more time for one another, they can flourish and grow strong with an overabundance of support for each other and a common ground they strive to conquer. Bond that the two Aquarians share in any way is fun. They can be friends, colleagues, business partner, lovers, spouse, sibling or relatives including the parents and children. They can always have fun in each other’s company and together they can always share a lot. Especially Aquarian parents are a great gift as they always have bright spirit and are always enthusiastic about their child’s any new development. Business partners and friends also work out well, more finely if they are working on same interests while colleagues are always very helpful and cheering. In a love relationship, the lovers and spouses can have some problem but with their cool nature they can always tackle things well. Both the Aquarians are highly unpredictable and even though they may get along in the beginning, this trait causes of problems later in the relationship. Appearances of a compatible and pleasant relationship are only skin deep. Underneath all of this lay problems that want to surface due to their impulsive and fickle personalities. They could be too much the social butterfly. Each is able to converse and get along with the others friends and social circles but so much so that it may burn them out, leaving no time for each other. With some compromise on both parts, this relationship can work out to be one of the most fulfilling and comfortable bonds between two people. They have a difficult time in expressing themselves to each other about everything in their world causing things between them to remain superficial and prevent things from getting too deep emotionally. Practicality and logic have their places in the lives but they should also try to be more expressive for their near ones especially when they know that the latter also has the same problem of being inexpressive. A union of two Aquarians who have different interests and activities causes a small risk - not talking on general topics, they can get lost in a maze of relationship, and then, realizing that they have lost common ground, will lose interest in each other. The compatibility horoscope of this couple warns: both of them for the sake of the marriage should always be together - direct communication feed them, they discover new features each other and which thereby draw them together and give an incentive to develop in parallel.